Films of Japanese American communities in Los Angeles, Stockton, and Tacoma, 1926-1933, by Buddhist minister, Rev. Sensho Sasaki. #9: 1) 2 little boys posing for camera; 2) Pan from temple to minister's house. People, lots of automobiles. 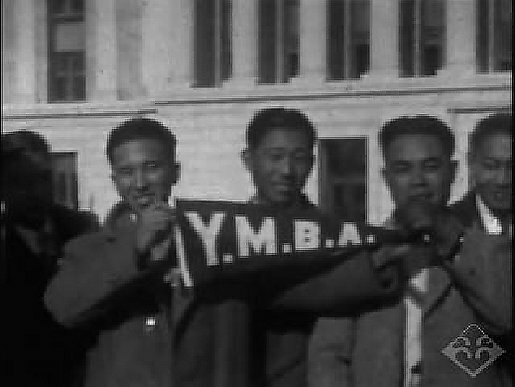 Various shots of YBA people in front of temple; 3) People posing for photograph; 4) Fujinkai women making bento; 5) People setting up for group shot in front of temple. Long pan of people set up for panorama photograph; 6) 2 boys dressed in soldier outfits, complete with backpack and guns. Playing, shooting, etc. (7:34). #11: 1 reel of b&w; 16mm film. Scenes include: 1) Chigo, procession down street. Automobiles, scene shot from second story; 2) Children posing for panoramic still. 3) Young woman walking down stairs; 4) Mother and sons, sons in beanies riding bicycles; 5) Swimming in pool; 6) River outing, swimming, boys eating sukiyaki, cooked outdoors; 7) University; 8) Tennis, seals; 9) San Francisco bay, ferry, people on ferry and bridge; 10) Rowing, playing in the snow, snowmen, very short baseball shot; 11) Playing golf; 12) Family in formal attire, touring; 13) Close-up pan of young girls. Girls waving goodbye as man takes off in automobile and heads down street; 14) People in front of temple; 15) Stockton baseball team; 16) Various shots of people at temple, all ages (16:04). #19: 1) Girls in front of temple(?). Fooling around, dancing the Charleston; 2) Yosemite touring. Various views, some with people. Automobile going through giant redwood tree; 3) 2 young girls posing with father; 4) Tennis; 5) Football; 6) Scruffy children eating (ice cream?). 2 boys playing in snow; 7) Speed boat races; 8) Tennis; 9) Boys and girls having fun posing for camera;10) Young athletes; 11) Baseball--not Japanese Americans; 12) Children going into temple; 13) Stockton and Yamato baseball teams, close-up pans and action; 14) YMBA (Young Men's Buddhist Association) young men leaving Sacramento; 15) Automobiles in downtown Sacramento (15:34). Credits: Rev. Sensho Sasaki Collection, Gift of the Sasaki Family, Japanese American National Museum (96.150). Preserved and made accessible in part by a grant from the National Film Preservation Foundation. HNRC — Atualizado em Set 09 2014 9:43 a.m. Welcome to the NEW Nikkei Album! We've launched Nikkei Album in beta, so everyone can now start uploading and creating their own albums. There may be things that don't work quite right yet. Please email us to report any errors. O que é o Álbum Nikkei? O site Descubra Nikkei é um lugar once você pode se conectar com outras pessoas e assim participar nas experiências dos nikkeis. Para continuar a manter e expandir este projeto, nós precisamos da sua ajuda!